Pat was re-elected President of the International Centre for Women Playwrights for 2019-20. 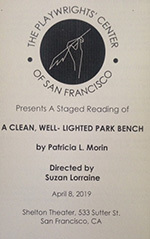 On April 8, 2019, a staged reading of Pat’s full-length play, "A Clean, Well-Lighted Park Bench," directed by Suzan Lorraine, was read at the Shelton Theatre, San Francisco. Pat was commissioned to write her play, titled "Jack," for the Egyptian god Wepwawet for the Olympian Festival. 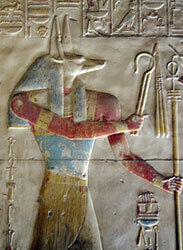 Wepwawet, Egyptian God, a scout for the armies, is known for creating openings and opportunities. The Jackal is a small African animal that sneaks food when the larger animals are already full. Both are known for cleverness. Her play was performed on Friday 10/6/17 at the Exit Theatre, 156 Eddy St., SF, CA. Pat's play "Appearances" was part of the Playwrights' Center of San Francisco's 24-Hour Play Festival on July 30, 2017. (All the plays are produced from scratch within 24 hours!) "Appearances" featured Hilda Roe (Sandy), Moshe Goodman (James) and Amanda Lee (Allison). 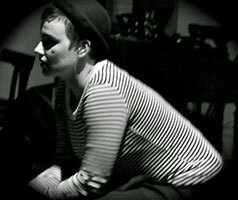 Pat's short play, "And So ..." was part of Flush Ink Productions' "She Speaks—Women's Works, Women's Words" festival, March 2017, in Waterloo, Ontario, Canada. Pat's Holiday flash play, "Conflicted," was selected for a reading at the Samuel French Film and Theatre Bookshop, 7623 Sunset Blvd., Los Angeles, CA on December 17, 2016. Pat's one-minute play "City Bench" was featured at Playwrights Foundation 5th Annual Flash Play Festival - Fast and Furiouswhere 40+ Bay Area playwrights participated in performances on 12/3/16 and 12/4/16 at the Brava Theater Center, 2481 24th St., SF, CA. 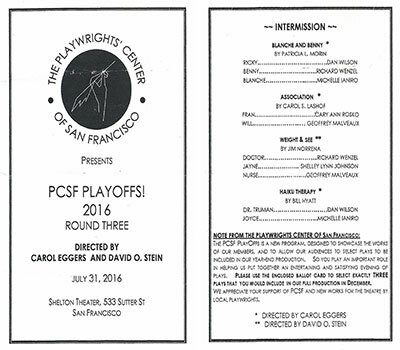 Pat's play "Blanche and Benny" was part of the PCSF Playoffs at the Shelton Theater in San Francisco on July 31, 2016. "Blanche and Benny" was also selected for an August 2015 production at the Community Market in Clintonville Ohio. Converted from the play "Where is Horatio T. Adams?" based on the novella in Mystery Montage, from my first short-story collection. The play centers around food conversation between two foodies: Benny, a gangster, who kidnaps Blanche, a crossword puzzle developer, as collateral for her husband's gambling debt. 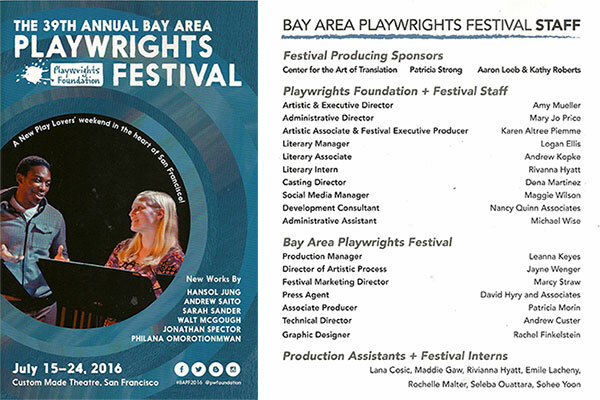 Pat was Associate Producer for the Playwright Foundation's 39th Annual Playwright Festival, July 2016 in San Francisco. 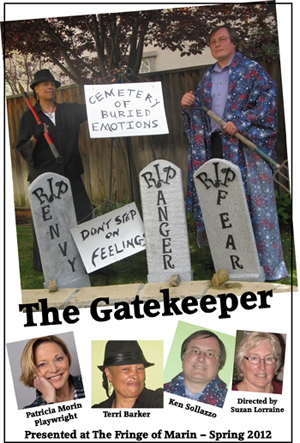 Preparing for the 25th anniversary gala of the Fringe of Marin, April 2, 2016: "The Gatekeeper" crew. The Gatekeeper crew, 2012 at the Fringe of Marin. 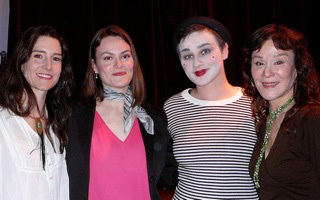 Sara Judge, producer; Ellen Dunphy playing Cara; Danielle Gray playing MIME; Carole Snow, director. A mime, played by Danielle Gray, meets a distraught CEO of an internet company, Ever Lasting Love Dating service, played by Ellen Dunphy. "A Clean Well-Lighted Park Bench" was produced in the Playwrights' Center of San Francisco Sheherezade 15 Festival. The play had its world premier with six performances in December 2015 at the Exit Stage Left Theatre. The play is set in a secluded park late at night when an elderly man sitting on a park bench talking to the moon is approached by a young mugger. 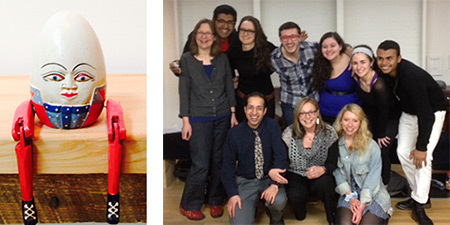 "A Clean Well-Lighted Park Bench" was also selected in July for the 2015 New York New Works Theatre Festival to be held at the Times Square Theatre in New York City (not produced). "Humpty Dumpty" is a commissioned play I wrote for production in NYC. The play was read by actors from the Marymount College at the Henry Miller Building on Lexington Avenue, NYC, on November 4, 2014 and on February 18, 2015. The full length humorous play is the brainchild of Kirk Gerchberg based on the four-line "Humpty Dumpty" (HD) children's riddle. The play answers the questions of how HD was created before the wall and what happened to HD after the fall. The production ensemble includes, puppets, human characters, original lyrics and scores that I wrote, and tango dancers. "Till the End" was selected by the Dramatists Guild of San Francisco for a reading held at the Tides Theatre in San Francisco on Jan. 5, 2015. The play is a 15-minute short about a man's survival instinct trying to talk himself out of committing suicide. Featuring Ken Sollazzo and Bill Chessman. Chessman also served as director. Ken Sollazzo: I'm currently in a show at Orinda ("Go Back for Murder" - Agatha Christie) and have been doing shows there for years now (in fact, I've been in every show for the last five seasons there, and will continue that run through this season). 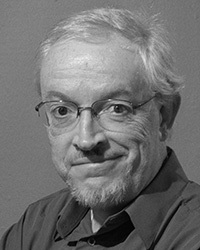 Bill Chessman is an actor, playwright and occasional director. He has performed on both sides of the San Francisco Bay and both sides of the Atlantic Ocean. His plays have been performed in the Bay Area, Big Sur, Salinas, Edinburgh, Baltimore, and Belleville, Illinois. 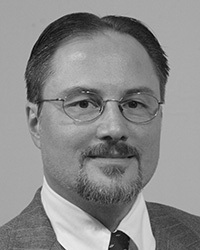 A number of his radio plays have been broadcast or streamed on the internet. People frequently tell him that he is very tall. 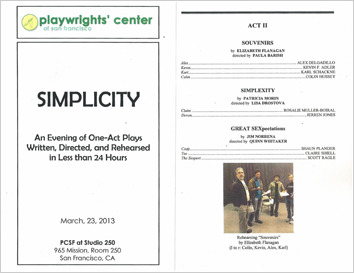 I was selected to write a play for the Playwrights' Center of San Francisco's (PCSF) 24-Hour Playwright Festival, performed on March 23, 2013 at PCSF's Studio 250 Theater. The production was a charitable event to support PCSF and included seven one-act plays comprising the Saturday evening format. All plays were written, directed, and rehearsed in less than 24 hours. The theme for the Festival, Simplicity, was chosen at random at 9 PM on Friday the night before the performance. All scripts had to be written and submitted the next day by 6:30 AM. The number of actors and the directors were also chosen at random. The play I wrote, titled "Simplexity," is a short, humorous play based on a random meeting between two college students at the campus coffee shop, Cafe 101. Claire, an art major, who just received a poor review of her painting from her art professor, is hysterical, and interrupts Devon, a lit major, talking on his cell phone while trying to make a deal to write another college student's lit paper. "Simplexity" was wonderfully directed by Lisa Drostova and the play was brought to life by two very talented actors: Rosalie Muller-Boiral, who played Claire, and Jerren Jones, who played Devon. You can view more information about the event here and watch the play on YouTube. 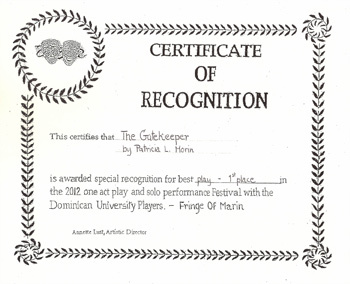 In June 2015, The Gatekeeper was voted as one of the best plays in Fringe of Marin's twenty-five year history. 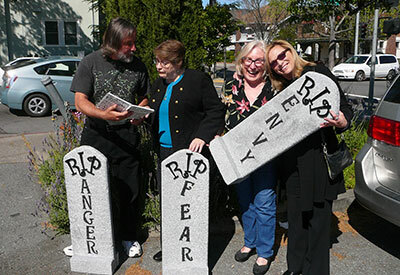 The Gatekeeper, a 20-minute humor-fantasy play that revolves around the cemetery of buried human emotions, won 1st place and Critics Choice awards at the 2012 Fringe of Marin Playwright Contest in San Rafael, CA. 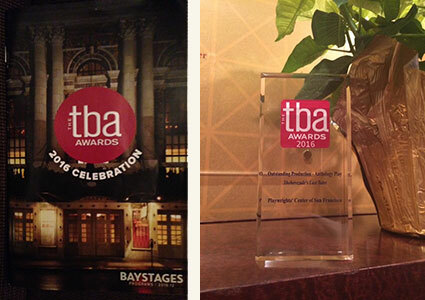 The play also received awards for Best Director, Best Actor, and Best Actress as well as Critics Choice Awards. Feedback included comments such as: creative, forward looking, and great dialogue. 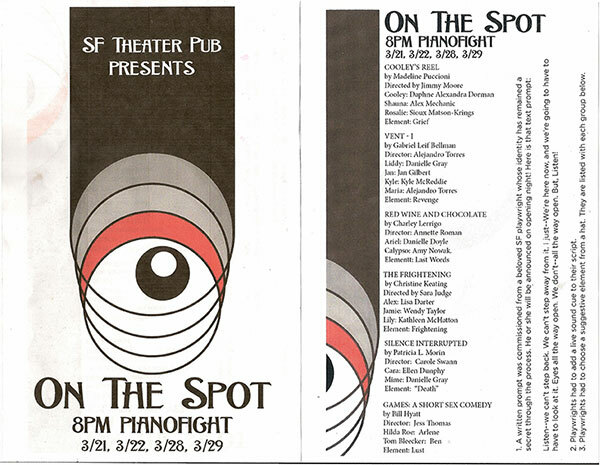 First place - Best Play - Fringe of Marin 2012 Playwright Contest and Critics' Choice. Also winner for Best Director, Best Actor, and Best Actress. Completed full-length play Talking to the Betta at Gotham in NYC. For those who love to write plays, there are three organizations that will help you get started, or help you improve your skill. 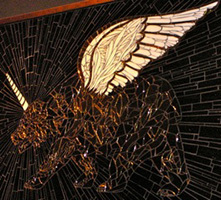 For workshops offered in San Francisco and Chicago, and consultations via email and phone, contact Will Dunne through www.WillDunne.com. 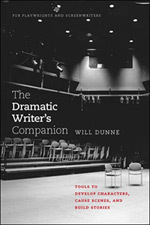 He has a great book to help you improve your playwriting and scriptwriting skills. I attended Will Dunne's workshop for three sessions and highly recommend it. 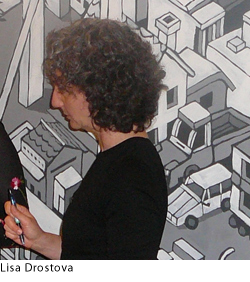 For women: The International Centre for Women Playwrights.